Thomas Vincent Learson (1912 – 1996) started to work for IBM in 1935 as a sales and marketing man. He became Vice President in 1954. In 1961, Learson assembled a task force - the SPREAD committee - to provide a vision for the company's future direction in computing. SPREAD, an abbreviation for Systems Programming, Research, Engineering, And Development, proposed the visionary idea that all future IBM computers should run the same programs and use the same peripheral equipment (tapes, disks, printers). The resulting System/360, introduced in 1964, became instantly a success. Learson played a key management role in the development of System/360 and became known as father of the 360. In 1966 he became IBM's President and from Jun 1971 through Jan 1973 the company's Chairman and Chief Executive Officer. 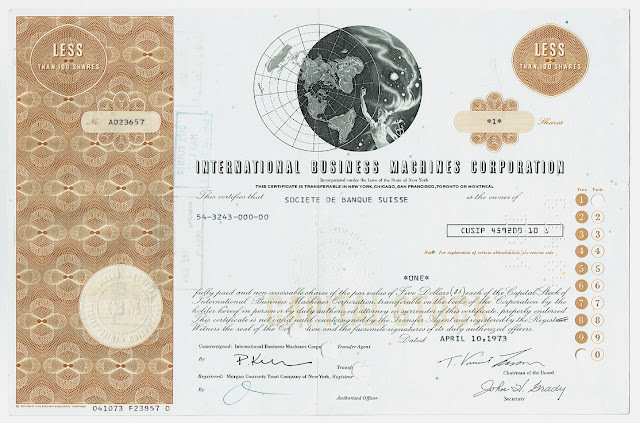 From 1975 to 1977 Vincent Learson was Ambassador at Large for the Law of the Sea Matters and Special Representative of the President for the Law of the Sea Conference, a multinational effort to establish international rules for maritime issues ranging from fishing rights to pollution. The IBM logo is not visibly printed but present as an embossed seal in the pale brown circle.